On the occasion of the 152nd anniversary of Zoravar Andranik Ozanyan (the Commander), Yerevan Mayor Taron Margaryan together with his deputies, heads of administrative districts and the members of “Sasun-Taron” patriotic union visited Yerablur Pantheon ad rendered the memory tribute to the Commander. The clergy of the Armenian Apostolic Church served the requiem liturgy for the Commander and all devoted martyrs of Armenian national freedom fight. 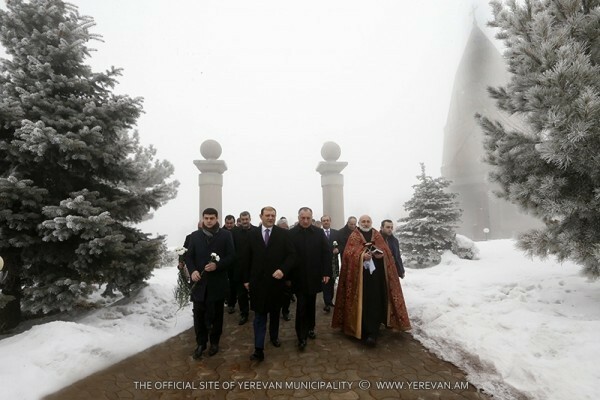 Mayor Taron Margaryan also laid flowers at the grave of Sparapet Vazgen Sargsyan and the memorial of the Unknown Soldier.